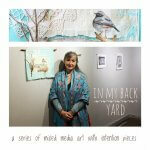 The Round Town News – why send a journalist when you can make it up? 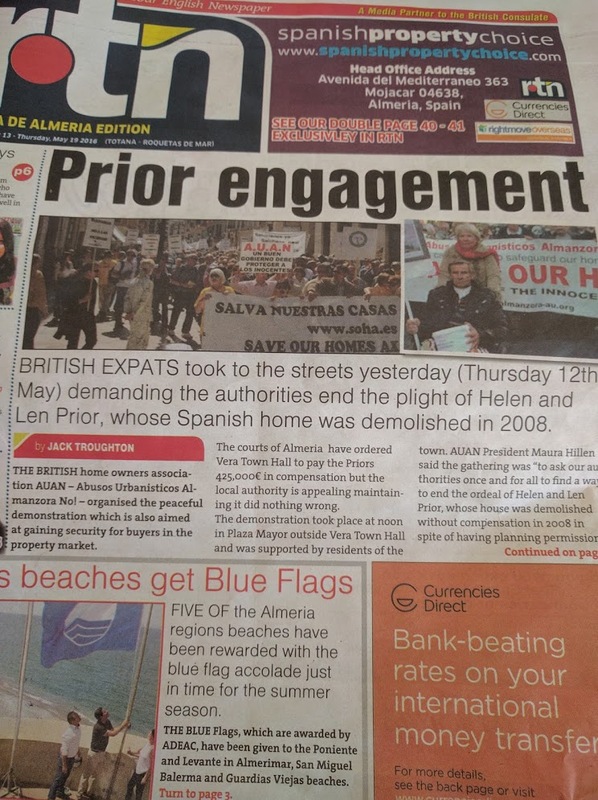 Nobody is keener that I to see local news reporting in English flourish in Almería. As I have always argued, a diversity of newspapers (and radio stations) improves the expat community, creating cohesion and attracting new people to this area. So I was originally delighted to hear the Round Town News was launching a new Almería edition. Another good paper, backed up with a solid team, can only help promote the area. Sadly, issue number 1 came and went with a poor distribution (I got one “sample” copy dropped off at my offices) and with a few re-writes of things I’d put on this blog included. Fair enough, issue one, I passed lightly over this. Didn’t even mention it on this blog, give them a break I thought. But issue two has just hit the streets, and left me with my jaw open. The Prior march is next week (May 19th). 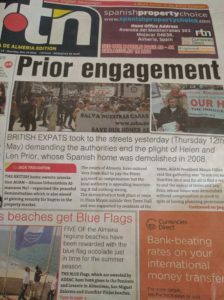 The photos of the “expats marching through Vera” appear to be of the Almería march several years ago. The entire story about the expats marching through Vera is a fabrication, followed by some information they got from AUAN past press releases. I imagine the writer, sitting in his Benidorm office, got his dates mixed up and just “imagined” what had happened without even bothering to look it up on the internet. And bear in mind the sheer importance of this story. It is a continuation of a story that has been echoed around the world, that shocked the very economy of the region, and which continues to impact upon the fortunes and future of tens of thousands of people across the province and further afield. Dismissed, without a second glance. I expect the AUAN will now have to spend valuable time and effort assuring supporters that they did not miss the event, that the event continues as planned and that people still need to turn up. Who knows how many supporters will now miss the main event due to this confusion? Furthermore, the secondary news story about five Almería beaches getting blue flags, is also a load of tosh. Twenty Five beaches got blue flags, more than any other province in Andalucía. We finally get some good news, and this is what happens. Oh, and their failure to understand the use of the possessive apostrophe doesn’t much improve my mood. So yes, I’m disappointed. Bitterly. The two main stories about Almería, one a fabrication and the other completely wrong. There are few other stories about the province, apart from an overly long re-print of a press release for a local Mojácar hotel group. We shall see if issue number three improves. I’d like to think so, but old cynic that I am, I doubt it. 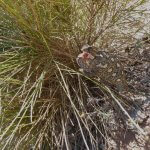 This entry was posted in Blog and tagged auan, journalism, reporting, round town news, urban corruption by David. Bookmark the permalink.